Visit this park overlooking the Chehalis River Estuary to see migrating songbirds, shorebirds, and geese in fall and breathtaking numbers of Bald Eagles in winter. Bald Eagles and Trumpeter Swans put the Chehalis River Estuary on the map more than 10 year ago, when it was designated an Important Bird Area. More than 1,000 eagles and at least 400 swans winter here annually — globally significant totals. Eagle Point Community Park provides access and viewing opportunities for the estuary. Eagles often perch in the trees near the main trail and fly overhead all day. The sight of more than 20 Bald Eagles sharing a single tree or 400 birds feeding together on sandbars is breathtaking no matter how many times we see it. Gord Gadsden is the founder and administrator of www.fraservalleybirding.com. Kathy Stewart is the caretaker for the Chehalis River Estuary Important Bird Area. Eagle Point Community Park is a greenspace overlooking the Chehalis River Estuary in southwestern British Columbia. From Mission, take the Lougheed Hwy. (Hwy. 7) for about 19 miles (30 km) to Morris Valley Rd. and turn left. Drive one mile (1.7 km) to a public parking area at Eagle Point Estates. Park here and follow the signs to the park. River estuary and riparian woods. Fall: Greater White-fronted Goose, Greater and Lesser Yellowlegs, Least, Western, and Baird’s Sandpipers, American Tree Sparrow, American Pipit, Black-throated Gray and Townsend’s Warblers, Western Meadowlark, and many other migrants. Winter: Barrow’s Goldeneye, Bald Eagle, Trumpeter and Tundra Swans, Northern Harrier, Evening Grosbeak, Northern Pygmy-Owl, Varied Thrush, Great Blue Heron, Wilson’s Snipe, and nine species of gull. Spring: Mountain Bluebird, Western Tanager, Turkey Vulture, Band-tailed Pigeon, Vaux’s Swift, Pacific-slope Flycatcher, Violet-green Swallow, Say’s Phoebe, and plenty of migrants. Summer: Common Yellowthroat, Gray Catbird, Black-headed Grosbeak, Yellow Warbler, Bullock’s Oriole, Willow Flycatcher, Red-eyed Vireo, Swainson’s Thrush, American Goldfinch, Osprey. Year-round. Eagle numbers best from late November to February. Viewing platform. 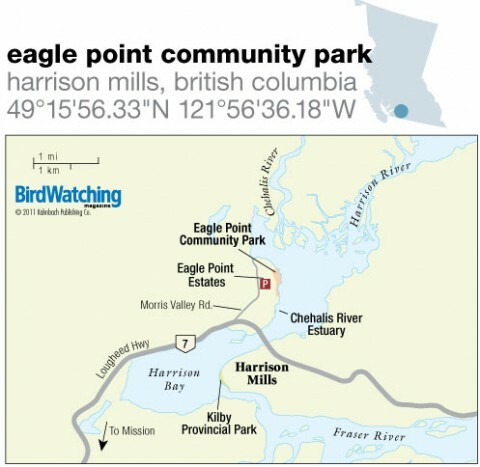 The park is the best of four eagle-viewing sites during the Fraser Valley Bald Eagle Festival, to be held November 19-20. Community park. No fees. Open year-round during daylight hours. Bring a spotting scope to scan for eagles, ducks, shorebirds, and gulls. In June, wear boots because a section of the trail often floods. Late-afternoon light best for viewing and photography. Southwest of Eagle Point Community Park on Harrison Bay in Harrison Mills. Excellent for wintering eagles and Trumpeter Swans, plus waterfowl, gulls, hawks, chickadees, jays, and Varied Thrush. 12 miles (20 km) northeast of Harrison Mills. Loons, grebes, and Snow Bunting in winter. Arctic Tern was spotted in fall 2010.